I think we need to concentrate on the technical aspects . . . but also not be afraid to delve into the political agendas that are driving the government over-reach. Since 2013 (1913 to be more accurate) a nightmare of incidents and crises have been unfolding before our eyes on the mainstream media. This is not by chance and it is mostly engineered crises. In many cases you are being told lies and propaganda by the mainstream media which serves the governments and corporations. The politicians are often 'bought and paid for' using lobbying, bribes, blackmail and other coersion methods and vested interests. The history books can be rewritten by the victors of the wars, as they strive to tie up all the loose ends in the aftermath. Spoils of war are the profits, that all too often, were the main hidden purpose of the war in the first place. We are time after time tricked and pushed into wars by carefully planned and executed psy-ops. Modern television and newspaper empires are run by people with agendas, so vote with your feet and ignore them, or maybe for the sake of 'know thy enemy' take only an occasional look. More people are waking up to government agendas and as a result are turning to alternative media, not all of which is to be believed, some of that stuff itself is psy-op trolling type propaganda. False staged events are used to sway public opinion to justify wars to benefit the investors in the military industrial complex and to justify the introduction of more draconian laws. We are rarely consulted and so the 'powers that be' just do what they want, helped by the 'revolving door' between government and the corporations. Do your own 'due diligence' research and I am sure that you will find these subjects all very fascinating and scary. Also you will then be 'armed' with more knowledge than most of the 'dumbed-down public'. The vast majority of people (the masses / the sheeple) are either blissfully unaware, or are happy to go along with it all - and do as they are told, provided their TV screens are getting bigger and their cars are getting shinier. Computers and hi-tech all increase government surveillance and can also be used by criminal elements. The 'powers that be', engineering all the conflict, are hoping that we will fight each other . . it is one of their methods - 'divide and conquer' then 'order out of chaos' (problem reaction solution), we must see through this and not blame the wrong people. To repeat . . . I think we need to concentrate on the technical aspects . . . but also not be afraid to delve into the political agendas that are driving the government over-reach. Tech tip - wrap your chip and pin card in tin foil. Not true. They act for the people's good! Thanks melodie . . . I am starting to learn French. I like the satirical art of David Dees http://ddees.com/ - there are galleries of his work on his website. Yes fun… Though I don't really see the link with what you wrote just before. Just fyi, on the image from Bickel, the writing on the building in the end of the path is "slaughter house". Bickel yes I can see his humour . . . and the word is the same in English . 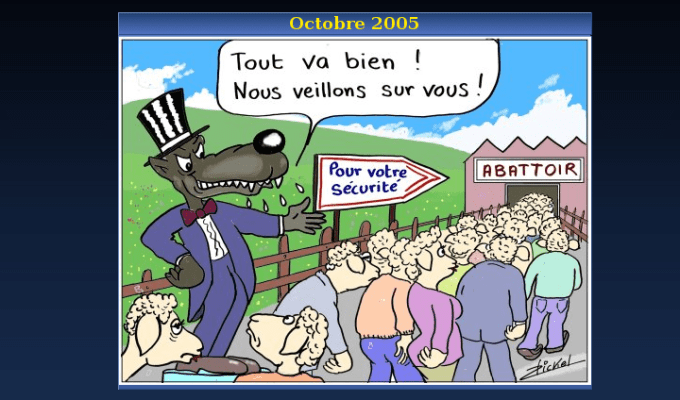 . . abattoir. David Dees in his satirical art, highlights corruption in today's era and shows the 'hidden hands pulling the strings'. He often portrays ordinary citizens in modern society as unaware victims (sheeple) who are enjoying being brainwashed and killed by their unhealthy lifestyles. There is also the brainwashing (propaganda) from the controlled media and the corporate takeover of the government to consider. To highlight the horrors of the modern age ddees sometimes compares today to 50 years ago. Sorry if I can see the link and others cannot, David Dees would be able to see the link. Anyway it does not matter really. To appreciate satirical art one has to concur with the subject material, otherwise it is not funny. Then I see. Just I don't know the guy and most of his styles, and also in Europe the average weight of the people is far lower than what can be seen in US. So I was not sure what the connection was with your presentation of the situation. Well, in fact you might appreciate to read that some other people think alike. Then in French, the "topics", and also the "topics2". I will look at it in more detaii later. Also in my post I did not say there was any kind of link to my original writings. I said (in response to you showing me the Bickel cartoon). My reason for posting that, was in response to your post (not to my post). You showed me some satirical art (a cartoon) and so I thought you might be interested in my favourite satirical artist. So in a way I suppose, I used your comment to bring the topic back to my original writings (fair enough). On that topic (mass mind manipulation and propaganda). Mark Twain once said something like . . . "It is easier to fool people than to convince them that they have been fooled". Therefore when I try to convince people that things are not what they seem . . . their normal reaction is to disagree with me and say I am a conspiracy nut. Eventually though, they start to realise there might be some truth in what I tell them. It is very satisfying when they eventually begin to tell me similar things and I can then say "I told you so". It is difficult to convince people as they mostly believe the mainstream media and government and corporate lies. The annoying thing is that in Britain we have to pay a TV license fee, which is used to feed us all the mainstream BS. I don't watch the mainstream British TV but I still have to pay. The alternative media also sometimes deliberately, or unknowingly, misleads people . . . half of it might be dis-information, so you need to be very careful and sift through it, without taking it on face value. Very difficult. People can't be bothered to do that. When people tell me that this or that politician is good, I think "shall I tell them what I know? . . ." sometimes it is not worth all the effort because they don't want to listen and will 'put up a wall'. Also some people have not got the mental capacity to think and analyse things very deeply . . . so telling them would be like throwing 'pearls to swine' it would be pointless. Like explaining technical things to non-technical people . . . they haven't a clue so they have to take a 'leap of faith' to take on board what you are saying and even then they don't understand what you are talking about. I'll retain this one! So true! So good!